Once every couple of weeks, myself and my junior fish monger production team make fish fingers. I used to buy them from the supermarket – back in the gluten days. I thought they tasted pretty good for frozen food out of a box. And then I began to read the fine print and realized (duh) there was a ton of sodium lurking amongst the fish. No wonder they tasted good. 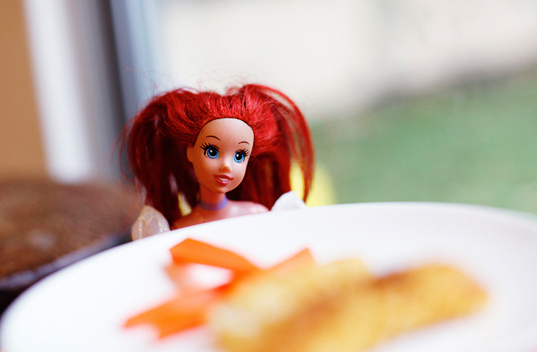 What else would Ariel like for dinner but fish fingers. So I decided to make our own. Then I could control exactly what went in them. The team factor is important. I’ve worked out if kids prepare (or think they’ve prepared) their own meals, there’s a slightly higher chance that they may eat it. Anyway back to the production line. You start with some beautiful fish. I like perch, ling or flathead. I got mine tonight from the same fish shop that sells world famous deep fried Mars Bars. They are a brilliant fish shop, but I’ve yet to try the Mars Bars. Which are not gluten free so I’m guessing I probably won’t have the chance. Allow yourself a good half hour to an hour to make these. It’s messy work so it’s not the time to multi-task. I usually make batches of about 30 small size fingers (about half the size of conventional frozen fish fingers). I keep mine uncooked in the freezer, and just pull out the quantity required. 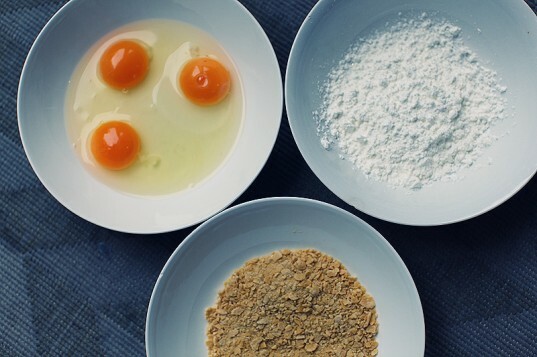 Clockwise from left; eggies, cornflour and the breadcrumb mix. (Please excuse the vagaries of the quantities – the amounts will vary depending on how much fish you buy). Fish – skin off – no bones. (I bought around 400 – 500g, but often double that amount so I can really crank my production line and have stacks to freeze). Cornflakes – again about a cup. I use the Norganic brand – just a personal taste preference. Breadcrumbs – whatever style you like. I use a corn based GF one. You could make your own which would probably be the nicest. About 2 cups. Put the cornflakes into a bag – I use ziplocks. Crush it all up with a rolling pin – the team usually love this job and often fight for the right to crush. 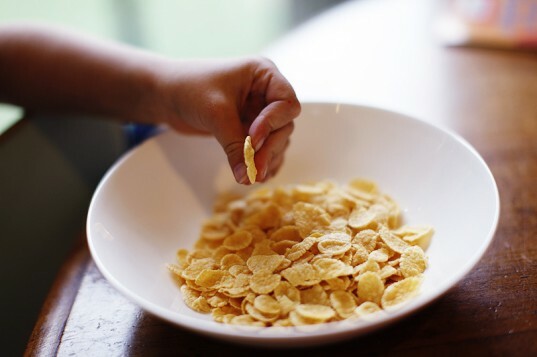 Mix the crushed up cornflakes together with the breadcrumbs in a bowl. Now get your production line ready. You’ll need 3 bowls – one for the flour, one for the beaten eggs and one for the cornflake/breadcrumb mixture. Put them in this order: flour, eggs and cornflakes. 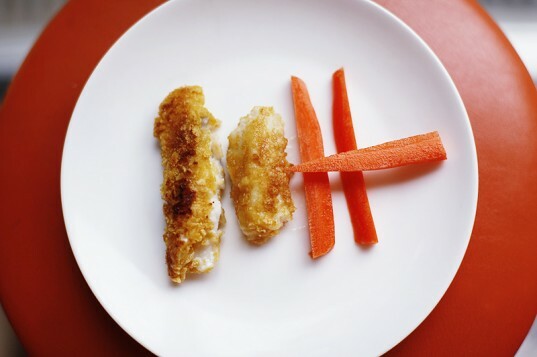 Get the fish out of the fridge and cut up into fish finger style pieces. I tend to make mine more like fish nuggets – but they can be any size or shape. Commence production line activity. 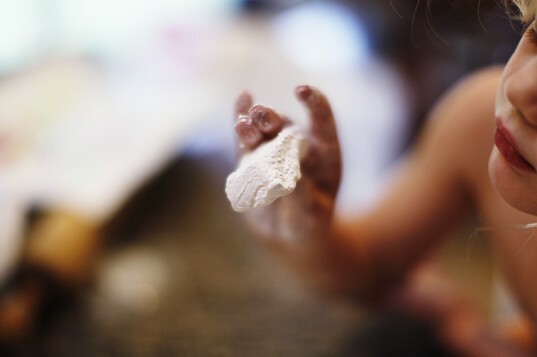 Start by dunking the fish in the flour – ensuring they are fully coated. But not totally drenched either. Bit of over-zealous flour coating going on here. Nothing a good dusting can’t fix. Then dip each fish finger into the egg. This is the point where your hands get messy and my phone usually rings or someone comes to the front door. Coat the fish with the cornflake/breadcrumb mix. Heat around a tablespoon of olive oil in a fry pan, and cook for about 4 – 5 minutes, or until cooked through and a nice golden brown colour. The standard accompaniments in our household are not very gourmet – carrot sticks and steamed corn. Oh and tomato sauce which personally I think is sacrilege but hey this isn’t about me. These are good as grown up fodder – just leave the fish in bigger pieces, and do not serve with tomato sauce. A nice home-made tartare, green salad and a glass of white woine will go swimmingly. The finished fishy fingers. Ready for Ariel.